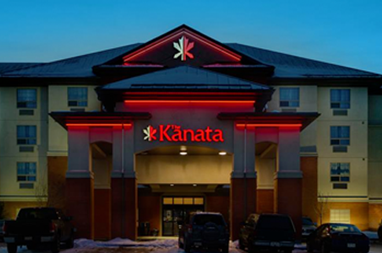 Experience the hospitality and comfort of Kanata Inns in Whitecourt. 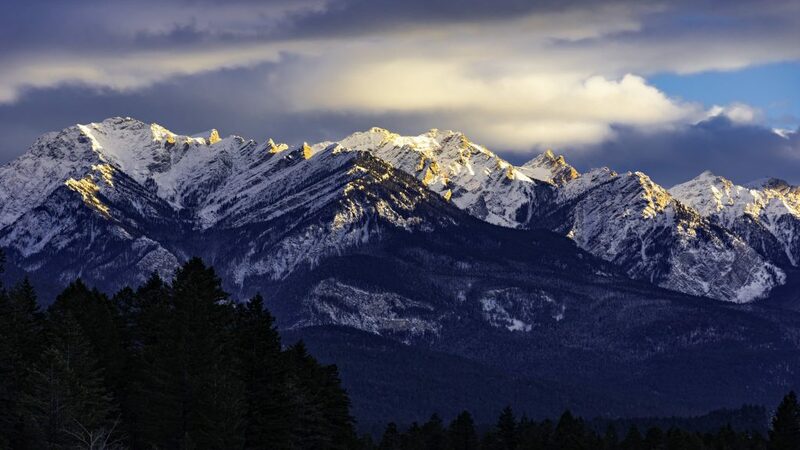 So go ahead, kick off your mukluks and mitts and let us show you how great true Canadian hospitality can be. Stay on track with your wellness routine, even when you’re traveling. Our fully equipped fitness center includes cardio machines, free weights, flat screen TVs and more. With Big Screen TVs and range of channels and shows in every room, the Kanata is one of the best places in Whitecourt to stay. 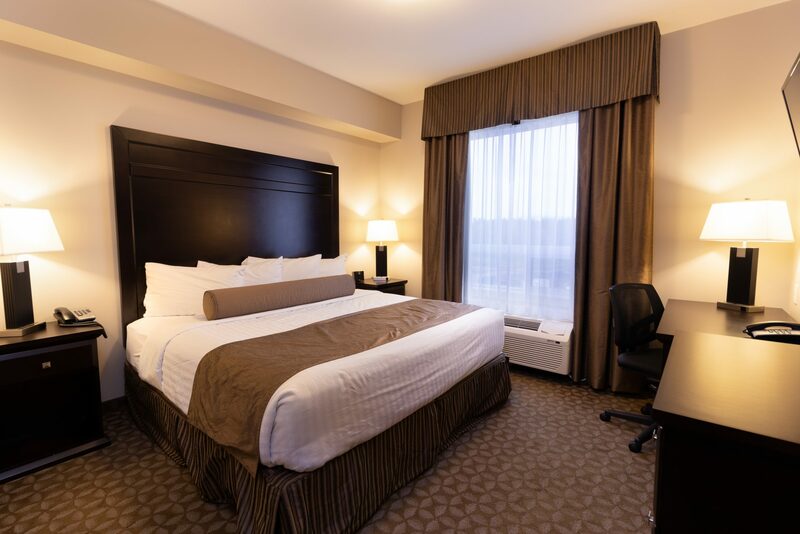 Our Single Queen Room is equipped with a 46″ Telus HD TV, dedicated wireless internet, Bluetooth iHome Clock Radio, access to our Fitness Room as well as a complimentary Hot Continental Breakfast. In room amenities include refrigerator, microwave, iron with ironing board, Keurig coffee maker, hairdryer and a lovely lounge area complete with a sofa. 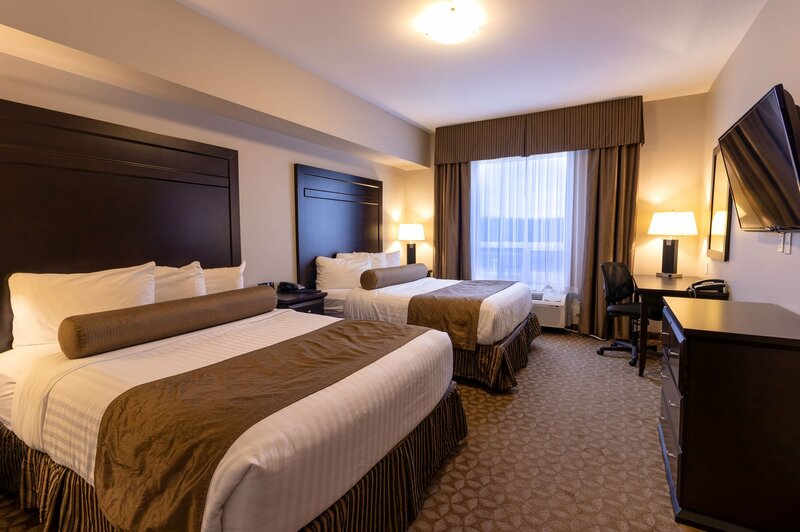 Our Standard Double Queen Room is equipped with a 46″ Telus HD TV, dedicated wireless internet, Bluetooth iHome Clock Radio, access to our Fitness Room as well as a complimentary hot continental breakfast. In room amenities include refrigerator and microwave as well as ironing board and iron, Keurig coffee maker and hairdryer. 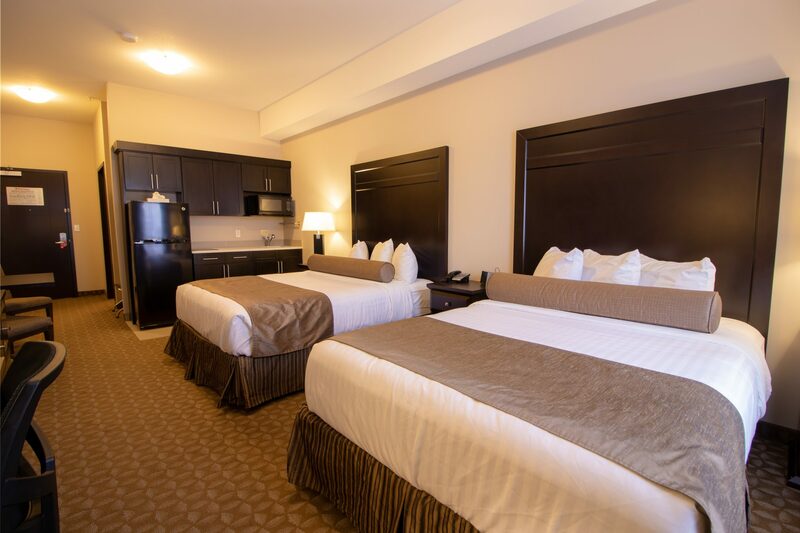 Our Double Queen Kitchenette Suite includes a separate bedroom with its own 46″ Telus HD TV and a kitchenette/living area equipped with another 46″ Telus HD TV. The room is equipped with dedicated wireless internet, Bluetooth iHome Clock Radio, access to our Fitness Room as well as a complimentary Hot Continental Breakfast. In room amenities include an apartment sized fridge, microwave and induction cooktop as well as ironing board and iron, Keurig coffee maker and hairdryer. Our Queen Kitchenette Suite includes outside access from your room. 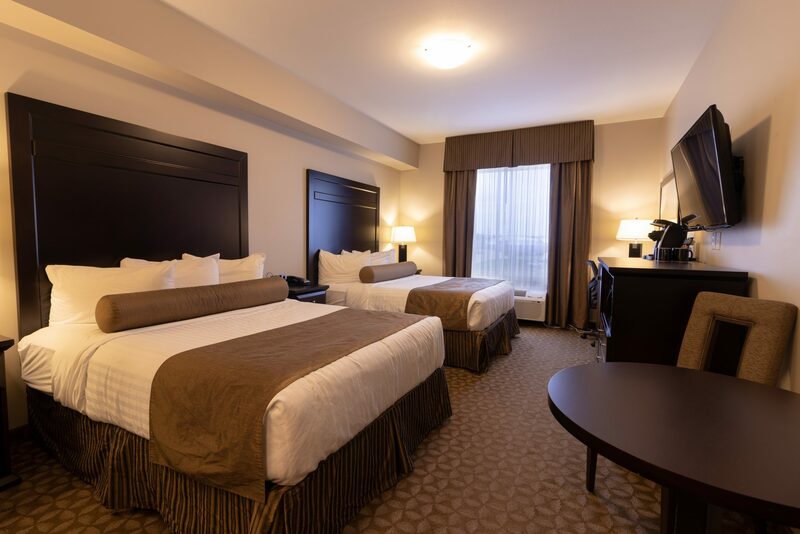 Our Double Queen Suite includes a separate bedroom with it’s own 46″ Telus HD TV and living area equipped with another 46″ Telus HD TV. The room is equipped with dedicated wireless internet, Bluetooth iHome Clock Radio, access to our Fitness Room as well as a complimentary Hot Continental Breakfast. In room amenities include a fridge, microwave and induction cook top as well as ironing board and iron, Keurig coffee maker and hairdryer. 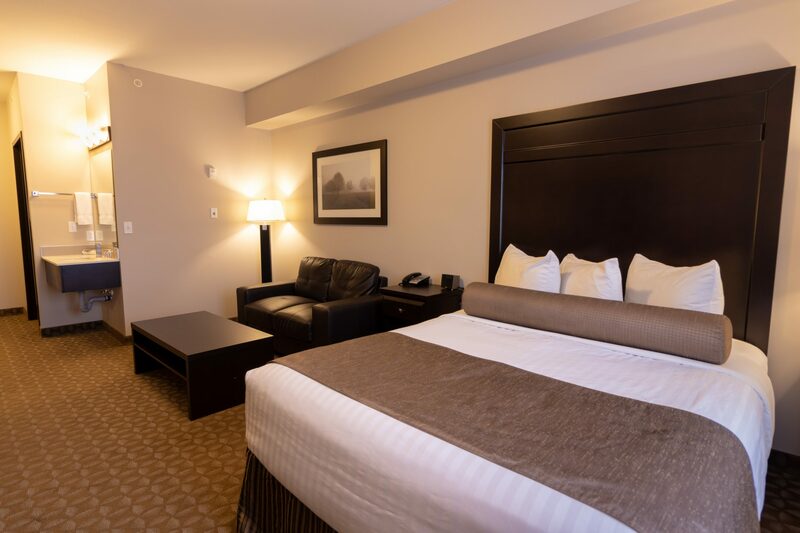 Our King Kitchenette Suite includes a separate bedroom with it’s own 46″ Telus HD TV and a kitchenette/living area equipped with another 46″ Telus HD TV. 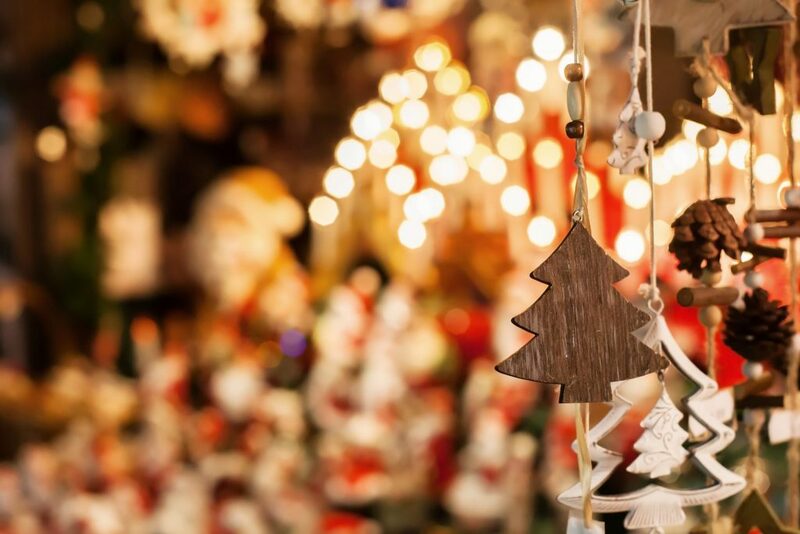 The room is equipped with dedicated wireless internet, Bluetooth iHome Clock Radio, access to our Fitness Room as well as a complimentary Hot Continental Breakfast. In room amenities include an apartment sized fridge, microwave and induction cook top as well as ironing board and iron, Keurig coffee maker and hairdryer. 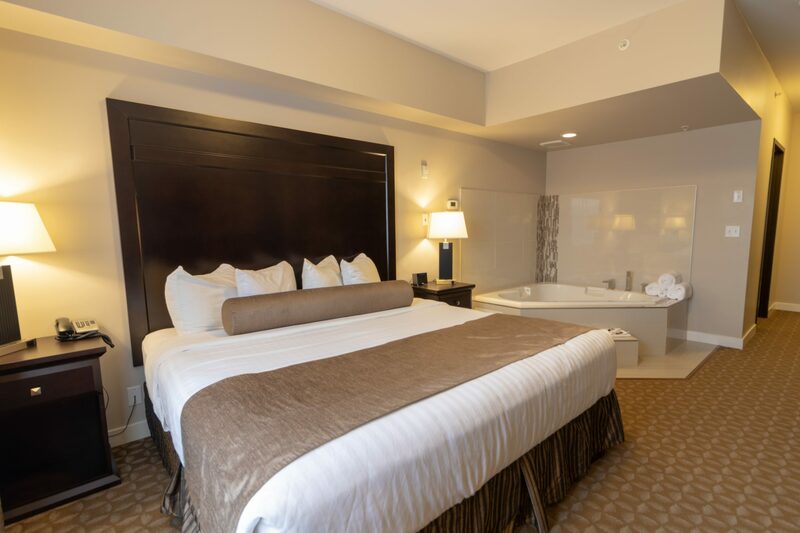 Our King Jacuzzi Room is equipped with a luxurious two person Jacuzzi tub, decorative fireplace, 46″ Telus HD TV, dedicated wireless internet, Bluetooth iHome Clock Radio, access to our Fitness Room as well as a complimentary Hot Continental Breakfast. In room amenities include refrigerator and microwave as well as ironing board and iron, Keurig coffee maker and hairdryer. Lounge chair and ottoman. 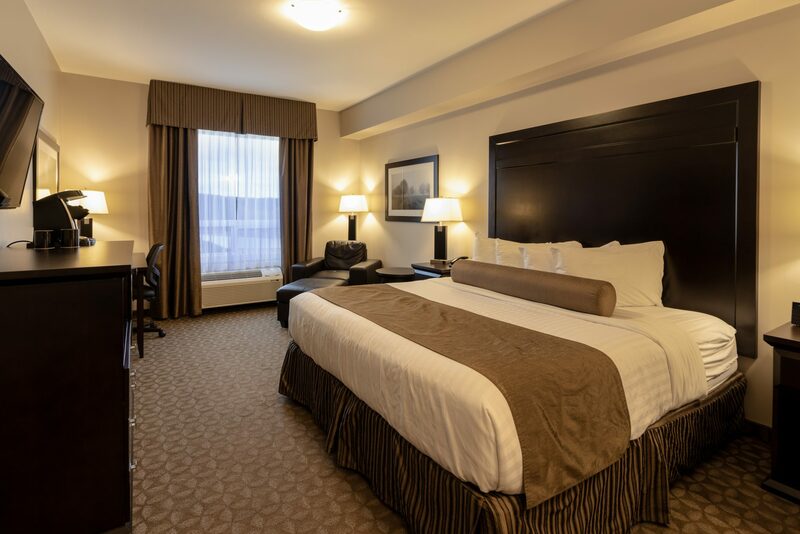 Our Executive King Room is equipped with a 46″ Telus HD TV, dedicated wireless internet, Bluetooth iHome Clock Radio, access to our Fitness Room as well as a complimentary Hot Continental Breakfast. In room amenities include refrigerator, microwave, iron with ironing board, Keurig coffee maker and hairdryer as well as a lounge chair and ottoman.